I don't put these models forward as superb renditions of the prototype - they are not. They are intended as approximate copies of the real thing. If there's anything wrong with them I'm very sorry, but they were great fun to build and this is my style of modelling! Now I just need to build another 20 or so to add to the 10 already on the layout. 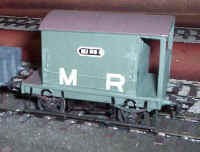 A scratchbuilt MR brakevan. Constructed from scribed plasticard with Society etched W irons, white metal springs and axleboxes. The transfers are a mixture of Society and HMRS. 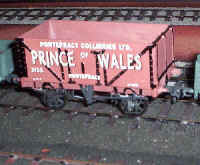 A Society cast RCH wagon with transfers from the 4mm Modelmaster range. The letters are a little undersize, but far better than I could achieve by lettering any other way. The black on the ironwork is done with a thick overhead projector pen. The Society MR open wagon. 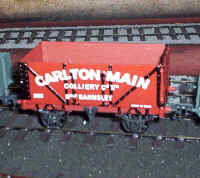 Another Society RCH with transfers from Modelmaster in Carlton Main livery. The Society North British open. Lettering is from some 4mm transfers and a little too small I suspect. The Society Cambrian open with Dragon Models 4mm scale transfers. I'm going to load this wagon with slates. A Society Cambrian wagon masquerading as a Midland wagon . The Exactoscale 4mm tarpaulin hides the wagons origin. Yet another RCH wagon, this time one of Alan Gibson's 1923 type. This is really too modern for the layout I suspect but it was my first S Scale wagon so I've decided to hang on to it. The body is out of scribed plasticard with the brass "ironwork" secured with superglue. The transfers are of course from the huge Modelmaster range.